The centre has been called into Ireland’s Six Nations squad, but it remains to be seen who he’ll line out for this weekend. Ringrose trained with Leinster in UCD yesterday. THERE WAS A brief moment of uncertainty yesterday afternoon when the IRFU’s squad update was issued in or around the same time as Leinster were delivering their own injury bulletin and Garry Ringrose was included in both. It’s not an unusual occurrence but the presumption was that the 23-year-old had linked up with the Ireland squad at their Carton House base along with Niall Scannell and John Cooney, only for him to be downstairs in Leinster HQ preparing for squad training at UCD. Ringrose did, in fact, train with the province, and not Ireland, yesterday afternoon and entered camp last night or will do so this morning as Joe Schmidt’s men prepare for Wales. It would suggest the centre, who has been sidelined for the last six weeks, and has played just 370 minutes of rugby this season, will likely make his return at the RDS on Friday night, rather than the Aviva on Saturday, although there is another perfectly logical explanation. 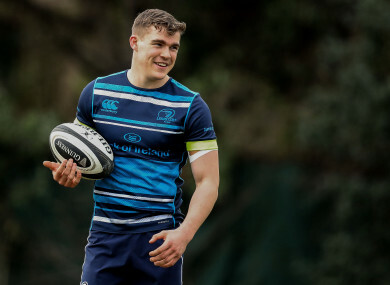 Monday sessions at Carton are ordinarily light runouts and if Ringrose is to be seriously considered for selection by Schmidt, it is likely he needs to get through as much work as possible, thus training with Leinster yesterday will have been more beneficial. Either way, Leinster have declared Ringrose available for their Pro14 clash with the Kings and whether he lines out in blue, or indeed green, this weekend is down to Schmidt. “I personally think it’s a push,” Leinster scrum coach John Fogarty says when asked if it would be too much of an ask for Ringrose to step straight back into international rugby. “But that’s my opinion on it. How long has Garry been out? Six weeks. I think it’s a tough one but on the other side of it, he’s so intelligent. If he’s physically really, really good, he’s probably one of the only guys you could move back in there. “There is much instinct that is sharpened through game time so that’s why I’m saying that these lads can sharpen themselves over one or two games. Some of them get back so quick, but sometimes they need that game for their own confidence. I’m not saying this is the case, it’s just my opinion on it. Ringrose was back in full training with Leinster towards the end of last week but the Scarlets game on Saturday came too soon for him, and reasoned thinking says he will play against the Kings and then be in line for the Scotland and England games. “That sounds about right, you get the guy back and you give him bit parts and then they play full games and then they’re back,” Fogarty adds. “It’s great to see him on his feet, moving around. It’s just great to see him on his feet because you know what he can offer. It’s also looking increasingly unlikely that Sean O’Brien will have any part to play in Ireland’s championship campaign as he continues to be assessed week-by-week in his comeback from hip surgery. The flanker, who has not played since the defeat of Exeter Chiefs at the Aviva in early December, was back running last week and the hope is that he’ll do some change of movement work this week before being re-integrated back into the rugby programme at Leinster. Fogarty explained: “Sean is one of those older players that you sort of have to go week-by-week as you get close. Sometimes guys are given x amount of weeks but for the older guys who have had a history of injuries, they sort of go week to week. “He ran last week and that was a positive. They’ll do change of angle or increase his workload this week. It goes from there and that’s the truth of it. We’re not trying to hide anything. He’s not going to be stressed further in his training week. We’ll see how he adapts to it and hopefully he adapts well. Luke McGrath is definitely out of Ireland’s final three games — but the knee injury he sustained in Saturday’s win over the Scarlets isn’t as bad as first feared. The scrum-half had a scan on Sunday which showed no serious damage and while the exact diagnosis has yet to be confirmed, Leinster are confident he will be back in time for their Champions Cup quarter-final against Saracens on 1 April. “Luke isn’t going to be available this week but I think everyone is very confident it’s not long-term,” Fogarty continued. “There’s not that worry downstairs [for Saracens] and I’m going off that. But he’s not a doubt for Saracens? “Jamie has progressed really well. He’s downstairs, he’s in good form and that’s a good indicator. Physically he’s getting through his bits, but again he’s week-to-week. The update on Isa Nacewa was slightly more definitive. Rested for the last two games — against Edinburgh and Scarlets — the 35-year-old’s availability has taken on an even greater layer of importance following the loss of Robbie Henshaw, and the Leinster management are keen to manage their captain. Nacewa — who has been sidelined with calf and ankle problems already this season — has continued to train with the squad and is expected to come back into contention for this weekend. “Yeah, it is frustrating for Isa,” Fogarty adds. “He is that type of athlete who the lads are cautious of. He is gung-ho. He is so invested in this place and the group of players, he desperately wants to be involved every week. “There is a certain amount of managing Isa. The medical staff have to manage Isa because they know he will hurt himself. “These are all really important fellas if they are in any team. They want to make sure they are returning the right way. That’s what is happening. That is what clouds it a little bit. “They could have tiny, minor setbacks and then they move forward and the same could happen again. So, you are very cautious in saying in three weeks, he will be back. Email “Fit-again Ringrose available for the Kings, but Leinster wait to hear Schmidt's call ”. Feedback on “Fit-again Ringrose available for the Kings, but Leinster wait to hear Schmidt's call ”.